We won’t hide from the fact that we are Matt Campbell fans here at The Race Torque, and just putting this out there, he has a lot more fans after yesterday’s win at the 2019 running of the Liqui-Moly Bathurst 12 Hour. From the perspective of someone sitting at home, albeit on the well-worn edge of my chair, here are some takeaways from the day. In a day when the bad sportsmanship flag went back into the bag at the end of 12 hours considerably faded, blocking had been a regular feature of the hand-to-hand combat on circuit. This one was simple: Raffaele Marciello got sold the dummy of the race. Things to consider – although Campbell had fresher tyres on board, but it wasn’t as if his car was an absolute rocket ship. Yes, he was ragging it, hard, but the Porsches didn’t have the straight-line advantage shown by the Bentleys, Aston Martins or Nismos. It was a hell of a battle for the minor placings – the Yellow GruppeM Racing AMG was a front runner all weekend long, Chaz Mostert in the BMW is a certified Bathurst ace, and clearly highly rated in the Munich marque’s universe, and the Bentley’s were in the fight the whole way. Despite the intensity of the action, and what was on the line, Campbell drove with his head, and set Marciello up a beauty. The moment the Merc flinched to cover Campbell on the outside, the Porsche darted inside, timed to perfection, executed inch perfect. Jake Dennis and the R-Motorsport Aston Martin were superstars throughout, and the fact that they were right in the equation to the finish is a tribute to their performance over the course of the entire event. You can’t overtake on top of The Mountain, but you might be able to make a move at the Elbow. Surprise attack maybe, but Matty made it stick, didn’t fence himself or the Aston. Job done. 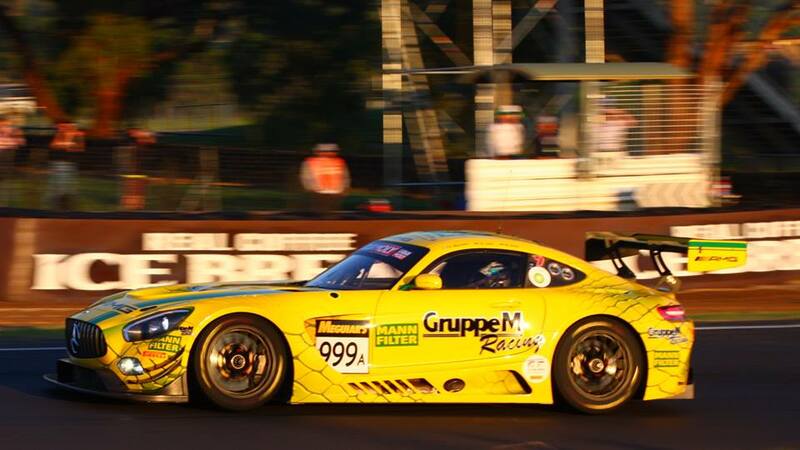 To drive from fifth to the win in the last stint at Bathurst is the making of a race driver. Did Campbell run Mostert off the track to get the job done? In an ideal world, there would be live video from all of the cars streamed back to race control, so that late-race decisions could be made while the cars continue to circulate. Unfortunately, that’s not the case, and with insufficient evidence from the live cameras, the decision was made to look at the incident further post-race. Just guessing, but keyboard warriors probably won’t be the people willing to pay for the technology upgrade. Instead of jumping the gun, the officials took the time to take in all evidence when it became available to them (ie post-race when SD cards could be removed from race cars), and what they considered to be the correct result was derived. 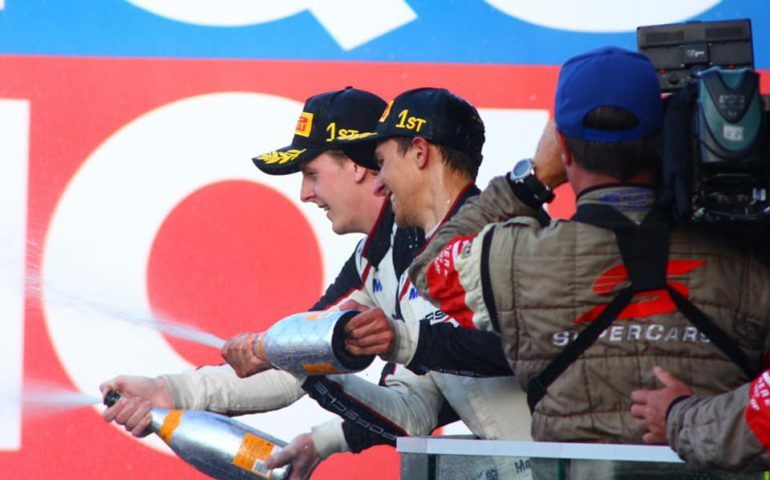 This article from John Dagys and Sportscar 365 caught my eye: Marciello: Victory Was “Stolen” from GruppeM Due to Penalties. “I think we got stolen from a victory, I think the Australians treat [race procedures] in a different way to us,” said Marciello. The race has rules and regulations, that are clearly stated prior to the event. But a lot of stuff in Australia is different. We are ruled by a bloke named ScoMo, our currency includes Rock Lobsters and Pineapples, and we enjoy smothering our toast with a thick tar-like substance called Vegemite. “[Triple Eight] got a drive through and they were able to fight it and it got removed,” Marciello continued. The solution here is clear: hire Roland Dane. Another solution: don’t overtake under safety car, especially in front of race control. Like, literally, 30m outside of the race control front window. As for Max Buhk’s penalty for weaving under safety car, this one is simple, and one that most of the field, including many other international guests were able to grasp. “I think this is not fair. It’s a great event but they should treat everyone equal. Instead of blaming others, why not instead of triple stinting tyres (a move to gain track position early in the final stint), bolt on new tyres late (the ultimate race winning strategy from the Earl Bamber Motorsport crew). Even fresh tyres on the recalcitrant T8 AMG under the last safety car put them only half a car length behind at the finish line. * The Balance of Performance seemed reasonably close to the money for the majority of the front runners, with a good mix of marques very close in qualifying and on the final result sheet. Legitimately, a lot of cars had a shot at victory, which is what it is all about. * One-two in the race were the final outings for the respective cars from Porsche and Aston Martin show that parity works, even for cars at the end of their life cycle. * Have you ever seen SVG, Lowndes and Whincup look so gumbooted after a stint in any race car, anywhere, ever? It was a most un-Triple 8 weekend, but they gave absolutely everything to only wind up two-tenths of a second short of the podium. * After the early Friday morning practice tear up of equipment, the race proved to be largely incident free. When you consider the 2018 Bathurst 1000, that’s nearly 3,000km of good, hard racing around The Mountain in recent times. How does ‘Balance of Performance’ work?